In the previous post, we took a look at these little critters that can bring about humongous headaches to cigar enthusiasts. Not everyone has experienced problems with cigar beetles because the idea is for manufacturers to lay down preventive measures from the outset. Well made cigars are supposed to treat their products in order to prevent infestation of the beetles. They are also tasked with the responsibility of keeping their factories and production areas immaculate in order to eradicate the possibility of cigar beetle infestation. Does this guarantee beetle-free cigars when they are stored at home? Definitely not! Sometimes, they still somehow find their way to your precious cigars. So what do you do when this happens? Do not panic! If you find telltale signs of cigar beetles â€“ youâ€™ll probably see pinhead sized holes in the cigars â€“ and you do so I the early stages, you still have hope of saving the rest of your stash. Jim Bennington gives us very specific instructions. First get ALL the cigars in the humidor, even those that do not seem to be contaminated. The chances are that they already have eggs and larvae inside. Put the cigars in Ziplock bags and/or Tupperware containers. Make sure that you double bag them and that the seals are tight and then put them in the freezer. The ideal temperature would be 10 F to 15 F (regular freezers) or -10 F (for deep freezers). For the former type of freezer, keep the cigars for 30 days. For the latter, keep the cigars for 15 days. In the meantime, clean your humidor very well, vacuum it even. Leave it open and air it. When the freezer days are up, do not immediately take the cigars out into the open. Instead, place them in the fridge for about 24 hours and then another 24 hours in room temperature. The beetles should be dead by then. If you have been a cigar enthusiast for quite some time now, you would know all about the dreaded cigar beetles. If you donâ€™t, then it is about time that you did. These little critters may have been cute when we were little kids â€“ how many of you collected beetles way back when? â€“ but they spell disaster for your cigars! Ever since tobacco farmers can remember, these beetles have been a serious threat to their crop and thus, their livelihood. Even tobacco factories are not exempt from these beetles. The scientific name of cigar beetles is Lasioderma serricorne. The one thing that they love to eat is â€“ you guessed it! â€“ tobacco leaves. Cigar beetles are very small and not easy to detect with the naked eye. They grow to about 2 to 3 millimeters long â€“ just about the size of a pinhead. If you are not careful with your cigar collection, you may not notice these beetles until your whole collection has been ruined! How do they ruin cigars? 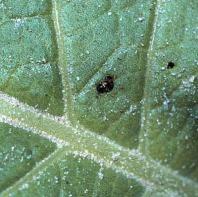 The adult beetles have a lifespan of 2 to 4 weeks and do not pose that much of a threat to the tobacco leaves. The larvae, on the other hand, present a whole different story. These tiny things can consume a huge amount of tobacco â€“ you just might be surprised at how much! What the adults do is to chew through the paper wrapper of the cigar to create a warm environment for the larvae within the leaves. Then your cigars are doomed. So how do you know if you have cigar beetle problems? How do you prevent these problems? Letâ€™s look at these in the next post.